As a grade school student, I lived for book orders. Does anyone else remember how exciting it was when the teacher handed these out? The annual Scholastic fliers distributed at the end of the day never made it into my backpack as instructed by the teacher. Instead, I clutched mine in hand as I boarded the bus, then spent the half hour ride home going over every book and trinket in detail. I would circle the ones I wanted with a marker (which inevitably turned out to be half the book order), then would hand it to Mom upon walking in the door. It’s worth noting that my sisters and I grew up in a rural township with the nearest town having a population of 250 and sporting nothing more than a bank, a post office and a Methodist church. (The bank eventually closed; the United States Postal Service has murmured about cutting the post office hours or possibly closing it, too.) Needless to say, we did not live in a library district, and the out-of-district fees were exorbitant. For that reason, Mom always made an effort to stock our personal libraries with new material to carry us through winter and summer breaks, when we had no access to school libraries. Between book orders and a nearby thrift store (where children’s books were 10 cents), we had well-stocked shelves. The only day better than when the fliers were handed out were the days the orders arrived. Like the fliers, the books never made it into my backpack. The bus ride home was spent reading a new book. I still remember devouring the first two chapters of the first Pony Pals book on the bus. I subsequently ordered books 2 through 4 from book orders. They look a little worse for the wear these days, but I still have them and cherish them. Unfortunately, I ran out of book orders to buy the rest of the series because I entered junior high. 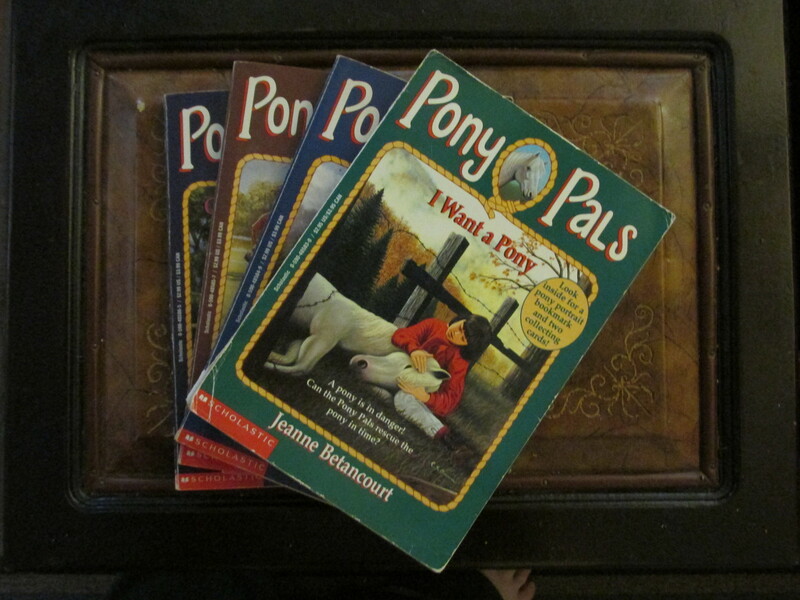 Now that I’m thinking about the Pony Pals books, it may be time to track down the rest of the series. Not for myself, of course. For my nieces. Maybe I’ll even host a story hour for them and read the books out loud. For the children, of course. This entry was posted in Reading and tagged books, children's books, family, reading. Bookmark the permalink.